Non-scale victories are so important. You know what we mean by non-scale victories, right? 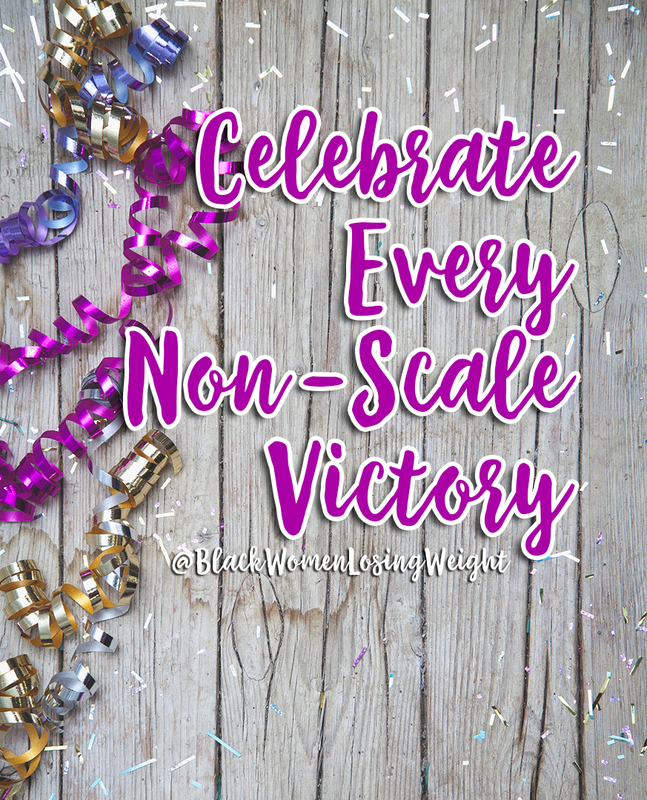 Here’s a list of some of the non-scale victories that ladies have shared with us over the years. Getting into that pair of jeans that you haven’t worn in years. Lowering your blood pressure or blood sugar numbers. Seeing an ex-boyfriend at the mall and NOT wanting to run in the other direction because you don’t want want him to see how many pounds you’ve gained. Wearing that outfit you’ve been holding on to since college. Being able to sit down on small chairs and not have them creak…or potentially break. When your fitness level increases. There is nothing like being able to really do pushups for the first time, doing your first pull up or doing what you thought you couldn’t physically. It’s amazing when you see that your hard work has made your body healthier and stronger. When you can see your collarbones. When you can see muscle definition that you didn’t have before. When the “muffin top” fat disappears from above your waist band. When it’s more comfortable to cross your legs. When your thighs don’t rub together as much and you have less chaffing. There is nothing like not being able to hear yourself walk in pantyhose (if you wear tights and pantyhose you may know the sound I’m talking about). When you no longer HAVE TO shop in the plus or women’s section of the store. …And let me just say that it’s not the size that is bad…it’s the lack of fashion that many of these plus size department have which is a shame. Why can’t they just make the same fashionable clothing in a fit that works on larger people. I know that your can’t transition every single item of clothes…but you can translate the trends, colors, fabrics, etc. Talking about how far you’ve come vs. talking about how far you have to go. Leave a comment below and tell us what your favorite non-scale victory is. Thanks for writing this great inspiration! MY FAVORITE ONE IS HATERS LOOKING YOU UP AND DOWN IN A SHOCK MANNER AND NOT SAY A WORD BECAUSE THEY SEE HOW GOOD YOU LOOK AND HOW MUCH WEIGHT YOU’VE LOST BUT WOULDN’T DARE SAY IT TO YOU BUT TO OTHER!!!! I struggled with relying on the scale too much. Even with all my effort it seems like the scale doesn’t move. A good friend told me to put the scale away and find other ways to measure my success. My most recent victory came in the form of a biometric screening. Seeing the improvement in my overall health over the last year was the motivation I needed to keep pushing forward.